Though he has dozens of amazing guitars, since 1986 Slash has used pretty much one very special Les Paul ® for all recording. The Alnico II Pro Slash was designed to give Slash's other Les Paul guitars-what he calls his "live guitars"-the exact tone of this legendary instrument. Warm, moderate output humbucker. Recommended for jazz, blues, and classic rock. 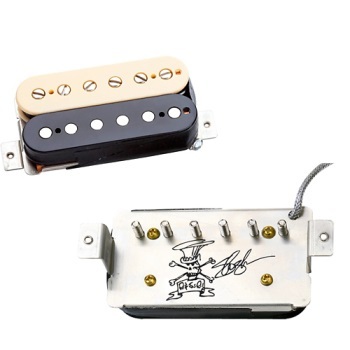 Like the standard APH-1 Alnico II Pro, this pickup uses an Alnico 2 magnet. However, the Slash model is wound with just enough boosted output to push a stock Les Paul toward the sweet sustain and rude crunch that characterizes Slash's sound as heard on hundreds of tracks.